I used to visit and revisit it a dozen times a day, and stand in deep contemplation over my vegetable progeny with a love that nobody could share or conceive of who had never taken part in the process of creation. It was one of the most bewitching sights in the world to observe a hill of beans thrusting aside the soil, or a rose of early peas just peeping forth sufficiently to trace a line of delicate green. As a farmer’s daughter, I’ve always been in love with gardens. There’s something so hopeful and optimistic about growing vegetables. You plant a seed, and then watch as it transforms into something that will either nourish your body, or provide a feast for your eyes through its beauty. You fight for it, waging a silent war against weeds, pests, hailstorms, and roving bands of deer and rabbits. You wait, sometimes patient and sometimes not, for a seed to sprout, a flower bud to open, or a tomato to ripen. And while you’re uncovering things in the dirt, you’re uncovering things within yourself as well. The process of gardening allows you to grow just as much as the plants under your care. I’m certainly not the only one who feels this way about gardening. People who love to dig in the dirt and grow things are a passionate lot, and thanks to the tanking economy, their numbers are spreading. More and more people are looking into starting a home garden this year. But, if you live in the inner city or have a tiny yard, then you might think you’re out of luck. But there is another option. You could start a community garden. A community garden is any patch of land that is worked on by a group of volunteers in a community. They’re often used to grow fruits and vegetables, but some community gardens also consist solely of flowers and retreat spaces. Having a public garden in your community offers tons of benefits. Community gardens beautify the area, especially if abandoned lots are used. They can transform ugly, nondescript patches of land into beautiful, interesting spaces. 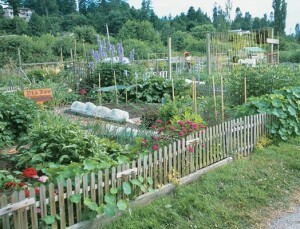 Community gardens provide food for residents, or the local food bank if the group decides to donate the harvest. If the food is kept, then volunteers have to spend less money on food; they get homegrown, nutritious fruit and vegetables for their labors. 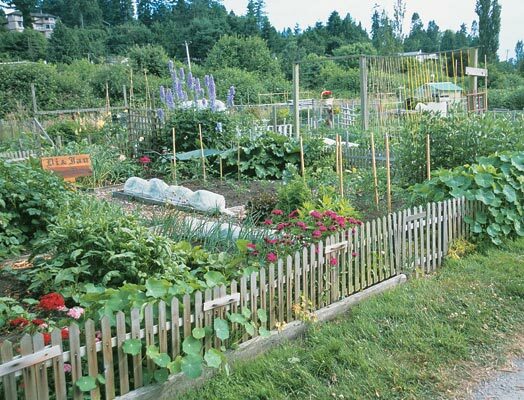 Community gardens teach people how to be more self-reliant. For children especially, they can be a wonderful learning experience, and enable everyone to reconnect with nature on a very personal level. Community gardens enhance a neighborhood’s spirit and social interaction. If you’d like to start your own community garden, then you should be aware that there are several steps involved. The information that follows was resourced from an excellent organization, the American Community Garden Association, as well as other sites on the web (there will be links to all of them). The ACGA website is incredibly informative, and I highly recommend you head over there if you need additional information. Before you do anything about starting a community garden you’ve got to come up with a plan. And, it doesn’t have to be elaborate. You can start a community garden with anyone. Neighbors, church groups, senior groups, schools, home-school groups, youth groups, civic associations, food pantries, businesses, apartment communities and others have all started their own community gardens. Who is interested in being involved with the community garden? How many people are for sure on board? Who will be in charge of fundraising, handling the donations coming in, planning the garden, etc.? Everyone should have a defined role. Will you be growing fruit, vegetables, flowers, trees, or a combination of all these things? Will the community garden be organic? Will you be gardening in-ground, or constructing raised beds? Is there any public land you could use, or will you have to contact a private resident and ask to use their land? Will they guarantee to give you space for the garden for at least 3 years (to give you and other volunteers some security)? What will the group do with the food that is harvested? Will all food be shared equally, or divvied up based on participation? Will the food be donated? If so, to whom? How much space do you really need? Gardens can be incredibly small; even if you only have a corner of a lot, you can still grow tomatoes, corn, and beans. Will every volunteer have their own private plot within the garden, or will it be one large, community effort? Can you find sponsors (either private donors, or local businesses) to help fund the garden’s start-up? Estimate much will you need for dirt, seeds, tools, plant stakes, water hoses, and fertilizer based on how much land you have (UrbanHarvest.org estimates that most community gardens cost between $1,000 to $4,000 to start, but small ones can be started with as little ast $200). If you can’t find donors to help offset the costs of the garden, will volunteers need to pay dues to fund these supplies? If so, how much? What will you name your garden? I know this may seem like a lot to mull over, but these are all questions that should be answered before you begin. When it comes to choosing the site for your community garden, you might have lots of choices, or just a few. You first need to decide if you’re going to use public land (owned by the state or city), or ask a private donor to use their land. If you can use public land, you need to identify who you need to ask for permission to turn that space into a community garden. If you have to use a someone’s personal land (someone with an extra large yard, or someone who owns an empty lot), then try to get them to sign a contract agreeing to let you use their land for at least 2-3 years. This will give your community garden secure time to get established and grow. Churches, synagogs, apartment complexes, schools, abandoned lots, city parks, and library property are all places you could start your community garden, providing you have permission, of course! Make sure the site gets at least 6 hours of direct sunlight per day. How will you water your garden at this location? Is there access to city water supply? A nearby river? How has this site been used in the past? Are there any pollution or contamination concerns? Now that you’ve got volunteers on board and a location picked out, you’re going to have to get everything prepped for planting season. This means planning a work day, cleaning up the site, and getting the beds ready for planting. You’ll also want to do planning for this as well. For instance, if you plant corn, you can plant beans at its base once it has started growing (the beans will naturally grow up the corn stalks). Planning where things will go, and when, is vital before you get started. If you’re coming up short for volunteers, then it’s time to get the word out. Post ads on Craigslist, announce the garden through Freecycle.org, post flyers in your neighborhood, and see if your local paper or TV news channel will do a story on your efforts. The more buzz you create about your community garden, the more volunteers you’ll have. You can visit the American Community Garden Association’s website here; they have a searchable database that will tell you, once you enter your zipcode, which community gardens are closest to you. How To Start A Community Garden | The Greenest Dollar | Home Improvement blog. Hello, we are interested in beginning a community garden in an unused lot on our property at 188th Street and Valentine Avenue in the Bronx. Could you provide us with any advice or refer us to any individuals or organizations who could help us in this endeavor? Your help would be greatly appreciated. Thank you! Hi, I am interested in creating community gardens at schools and food pantries. Do you know who I should ask at the public schools for permission and when? I have read the list of things to do and was very helpful. Now I want to put it all into action for the spring of 2016. I will start with one location at a time and every year add a new location. not only am i interested in the idea of community gardens, im also writing a paper on the subject for my english paper. I am writing my paper as a proposal to present at city hall. and wanted to ask a few questions on the matter. 1. what would be the estiamted price of a garden with planter boxes verus planted directly in the soil?? 2. can botanical garden be reasonably priced for commerical parts of a community?? 3. what is the average size of a community garden?? thank you in advanced for all your help!!!!! !